SQL Server 2005 introduced many changes to the Memory Architecture. Majority of these architectural changes continued till SQL Server 2008 R2. In this post, I will try to cover a high level overview of architectural changes introduced in SQL 2005. Slava Oak’s has a blog post explaining these components in details. Most of what follows is an attempt at simplifying what Slava mentions his blog. Memory Node: Memory nodes are internal SQLOS objects. The number of memory nodes depends on the NUMA configuration of the server. 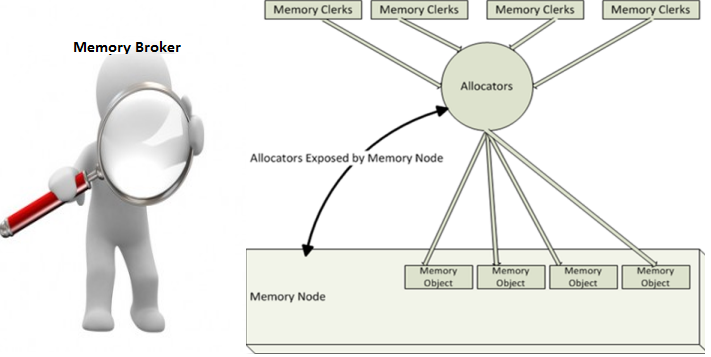 Memory nodes can be thought of as a large pool of Memory, which different components (Clerks) can allocate memory from. Memory Nodes expose a set of Allocators which are used by all memory Clerks to allocate the desired amount of memory from the Node. Page Allocators: There are 4 primary types of page allocators exposed by the memory node. These allocators are used to allocate a set of 8KB pages. Remember that SQL Server page granularity is 8KB and any memory allocated by these page allocators would always be in multiple of 8KB. Single Page Allocator: As the name suggests, this allocator is used to allocate one 8KB page at a time. Large Page Allocators: These are used to allocate Large Pages. This feature is only present in IA64 or X64 editions of SQL, running on servers with more than 8GB of memory. Trace Flag 834 has to be enabled in order for SQL to use Large Pages. On a X64 server the Large Page granularity is 2MB, while on IA64 its 16MB. Reserved Pages: Is special purpose allocator, which allocates a set of pages for emergencies. Typically the “Fail Safe” memory for SQL. Virtual Memory Allocator: Uses Windows VirtualAlloc API’s, when SQL needs to allocate contigous memory which does not necessarily fall in the 8K page boundary. Shared Memory Allocator: Uses windows file mapping API’s and provides LPC (shared memory) capabilities. DBCC memory status gives some information about the Memory Nodes, but they are NOT exactly memory node but CPU nodes. Locked Pages allocated would only show up when SQL Server has been configured to use Lock Pages in memory. Memory Clerks: Clerks are consumers of memory in SQL. In general there are 4 kinds of clerks, generic, cache store, object store, user store. The clerks make use of the memory node allocators to allocate memory. SQL has a vast number of Clerks predefined, and each of these clerks corresponds to the type of allocation which needs to be done. SQL exposes the clerk information using the “sys.dm_os_memory_clerks” DMV. This information is also exposed through the DBCC MEMORYSTATUS. In the memory status output one can see the clerks being listed multiple times. This is because of the fact that the clerks are created per NUMA node. So if we have 4 NUMA nodes on the machine, we could see the clerks being reported 4 times. Memory Objects: Memory objects are the memory allocations made through the clerks. There are 3 kinds of memory objects which are supported by SQL. Memory objects can be viewed using the “sys.dm_os_memory_objects” DMV. Variable Memory Object: Supports variable size memory allocations. Mark/Shrink Objects: This allocations are typically done in two stages. During the first stage the allocations grows in size (more and more memory are added as part of this allocation) and during the second phase the memory is de-allocated. As Slava points out, these type of allocations are very useful in scenarios like compilation or execution. Fixed Size Memory objects: Supports memory allocations which are fixed in size. Memory Broker: Memory broker can be though of as the Ring Master in a Circus. The purpose of Memory Broker is to provide a centralized mechanism to distribute memory or control the allocations made by each component in SQL Server. Memory Broker monitors the demand consumption of memory by each component and then based on the information collected, it calculates and optimal value of memory for each of these components. This information is then broadcast to each of the components, which grow or shrink their usage as required. Memory broker is exposed through the DMV “sys.dm_os_ring_buffers” where the Ring_buffer_type is “RING_BUFFER_MEMORY_BROKER”. To tie these pieces together. In order for the Clerks to allocated Memory, they have to create a memory object using one of the Allocators exposed by the Memory Node. These allocations (memory objects) could be of any type as mentioned above. This entire allocation and de-allocation is monitored by the memory broker, which redirects the clerks to grow/shrink their memory usage as required. In the next post, I will talk about the memory clerks in more details. Thanks Prashant.. the parts are coming in soon..